As you probably know by now, the so-called "predators" are vicious intergalactic big game hunters who hunt the just-as-nasty aliens for sport. In Aliens vs. 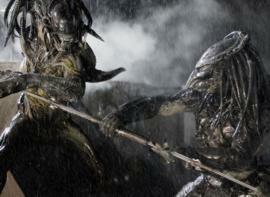 Predator: Requiem (or Aliens vs. Predator 2 as it is named outside the States) a predator spaceship containing a "predalien" hybrid - think an alien with dreadlocks - and several alien face huggers crash-lands on Earth. A single predator speeds off to Earth to clean up the mess left behind by the aliens now running rampant in a small Colorado town, literally using a blue liquid that looks suspiciously like neon blue dish detergent! Of course we have human collateral: the characters that will get caught in the crossfire between the two opposing monsters. Here they are a bunch of nondescript youngsters including a pizza delivery boy and his unemployed elder brother, a woman soldier on leave from her tour of duty in Iraq and her kid, the town sheriff. The Iraqi vet can handily drive U.S. armored vehicles and fly a helicopter (then again they can all do that in Hollywood action movies). She also has a passing resemblance to a younger Sigourney Weaver. Some scenes (probably deliberately) evoke James Cameron's celebrated 1986 Aliens with national guardsmen getting their asses whupped by aliens. Just like in the Cameron flick things get nuked real good at the end with the heroes barely escaping in a helicopter. Homage or creative bankruptcy? You decide. To be fair there are some in-jokes and references tossed at die-hard fans. One of the characters is named Dallas (a character in Ridley Scott's original was also named Dallas) and towards the end we're introduced to the head of the Yutani Corporation. But we're still leaning towards the "lack of good ideas" explanation here. You see, to be honest, we have to ask ourselves whether either of these movie monsters is still that interesting or scary anymore. Recently 30 Days of Night used the same plot of a small town under attack by predatory monsters, but managed to be a much scarier and better movie than Requiem. Why? Because of the way in which it reinvented the stock vampire villain as something truly frightening again in a fresh way. ". . . the sort of generic woods setting one sees in StarGate: Atlantis on TV each week." What is in effect the eighth Alien movie in a franchise that turns twenty-nine in 2008, Requiem is given the sort of treatment usually afforded to direct-to-DVD releases: a low budget with no name actors and a creative team (“The Brother Krause”) best known for their music videos making their directorial debut. The first Alien flick was set in outer space, the first Predator movie in a steaming South American jungle. Here the action is set in the real-life Colorado town of Gunniston (one wonders how their local tourism board okayed Hollywood using the town’s real name in the movie). This is not just a sign of how the budgets for each instalment in the franchise became smaller, but also how the action is becoming more mundane. Even the previous 2004 instalment was set in an ancient Aztec temple buried beneath the Arctic snow, which was dumb, but at least more interesting than the sort of generic woods setting one sees in StarGate: Atlantis on TV each week. In Requiem we have the same old movie monsters, and even though the action is much gorier now as promised, this is a movie with less gravitas than a video game. We care little for the bland characters and worse, the action is poorly presented: many of the alien duking it out with predator scenes are simply muddled and difficult to follow — under-lit with choppy editing. Add to this a predictable by-the-numbers screenplay in which the only surprise is the sadistic fate befalling some pregnant women in the local hospital and you’ll probably find yourself impatiently tapping your fingers as I did waiting for the movie to go through its motions. Rumor has it that director Ridley Scott was toying around with directing a fifth Alien movie when it was announced that the first Alien vs. Predator movie would be made. Upon hearing the news Scott dropped his project, declaring that combining the two franchises would “dilute” them. In retrospect he was right. Unless 20th Century Fox is willing to invest some serious capital and big name stars in this franchise again, Requiem is the best we can hope for from any Alien movie. Best would however be to simply retire both these by-now over-familiar movie monsters . . .
Read more about Aliens vs. Predator - Requiem (plot summary, trivia, photo gallery, article and more). Read our DVD Review (Unrated Edition).